Planet Hollywood at Walt Disney World is working on some changes for the restaurant’s look once Downtown Disney becomes rebranded as Disney Springs. The dining location has been under refurbishment and some of the plans have finally been revealed. 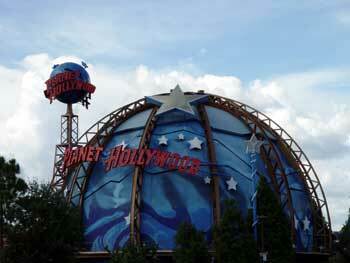 The name will change to Planet Hollywood Observatory and the famous blue globe will be “surrounded by a brick exterior and an expanded outdoor terrace and bar.” The sign outside the restaurant will be turned into a water tower and the lake will be removed. There will be a new menu and revamped décor inside. Props from Hollywood films will still be featured in the restaurant and lounge, but the inside will look like “a high-tech planetarium with stars and constellations on the ceiling.” Earl says the theme will be “dine amongst the stars.” Celebrity chefs will be involved in the menu change, but the prices will stay the same.